Summary: Somtimes refreshingly retro, but all too often a clichéd action film that never lives up to its characters' ideals. 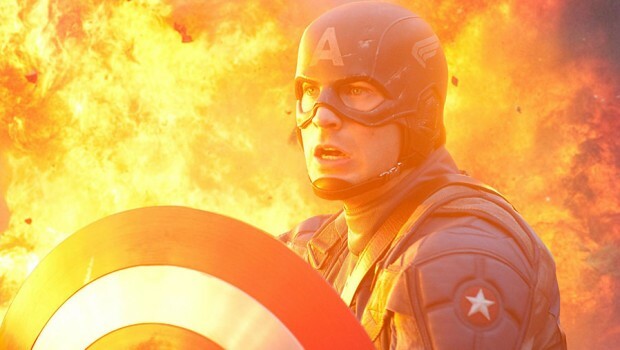 The build up to The Avengers movie in summer 2012 continues with the introduction of another of the line-up via this origins movie Captain America: The First Avenger. The Marvel superhero will eventually be joined on screen by the Hulk and Iron Man, now well known to movie-goers, along with Thor, who also gets his own film this summer, Nick Fury and Black Widow (the latter pair seen in Iron Man 2). Taking on the titular role is a man no stranger to donning tight suits: Chris Evans – The Human Torch in The Fantastic Four films. While the very name Captain America may not stir up as much excitement outside the United States as more popular Marvel characters Spider-man and the X-Men, the promise of a big screen adaptation that will be leading into a major blockbuster the following year suggests Marvel will want to ensure it offers maximum entertainment for fans and non-fans alike to get a lock for next summer’s major event. An intentionally-patriotic character, the comic iteration of Captain America dates back to 1941 when he fought against World War Two enemies representing Nazism, fascism and Communism. The alter ego of Steven Rogers, Captain America is a super soldier who got his power from an experimental serum that gives him maximum human performance. Aided by an indestructible shield he also uses as a weapon, he may look a little ridiculous in his blue outfit in stills seen from the movie so far, but with seasoned action director Joe Johnston (Jurassic Park III, Rocketeer, Jumanji) at the helm, the action will come thick and fast as we see Rogers grow into America’s warrior against the forces of evil – those that most conflict with America’s ideals. In this opening film, we’ll see Howard Stark (the father of Iron Man’s alter ego Tony Stark in the form of Dominic Cooper) make an appearance as the link for The Avengers film and Captain America will be battling Nazi agent George Maxon – aka Red Skull – played by Hugo Weaving. Weaving has the chance to be dark and sinister in the vein of his Agent Smith character in The Matrix having opted for more heroic roles since the Wachowski brother’s triology. Tommy Lee Jones will also feature as US Army Colonel Chester Phillips, the sort of role he can sleepwalk through, but all eyes will be on Evans to see if he can carry a whole movie. It’s a big ask of Evans as he’s rarely been considered a bankable star or even much more than eye candy for the ladies so Captain America fans will have their fingers crossed he’s cut out for the part in acting talent as much as looks.